=""> Dave Lindorff, host of the Progressive Radio Network program "ThisCantBeHappening! 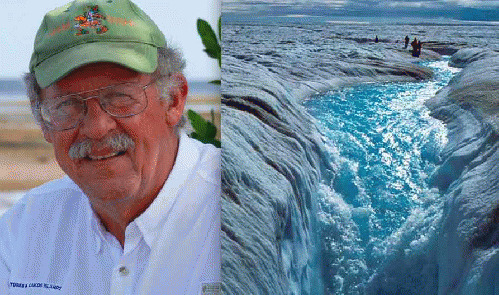 ", interviews Professor Harold Wanless, chair of the Geology Department at the University of Miami and a leading climate change expert. Wanless talks about the latest Intergovernmental Panel on Climate Change (IPCC) report, explaining that as scary as that organization's latest predictions are concerning accelerating global warming, it is far too conservative. This is because the IPCC does not factor in the feedback loops that are making things get worse faster -- whether it's the doubling of the pace of Greenland and Western Antarctic ice melt every seven years, or the future release of massive methane deposits in permafrost and undersea methyl cathrates--a process that is already beginning. If we don't act quickly to significantly reduce the use of carbon fuels, Wanless warns, we could see a "baked in" 70-foot sea rise, perhaps in our children's or grandchildren's lives, and even with a less apocalyptic sea rise, an end to human civilization--and that's with the amount of carbon that we humans have already put in the atmosphere.